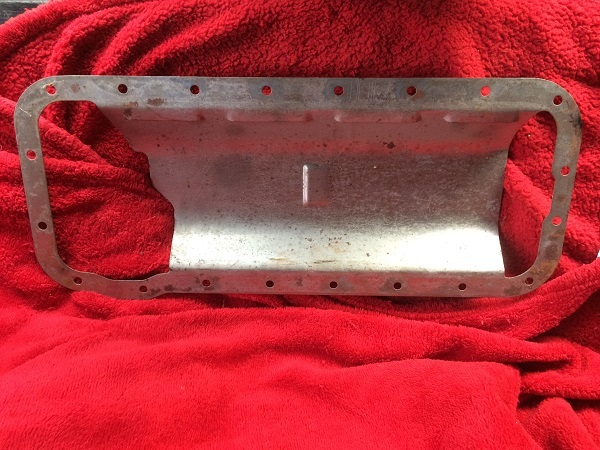 A stamped steel, front-sump oil pan was originally used on 428 CJ and SCJ engines. 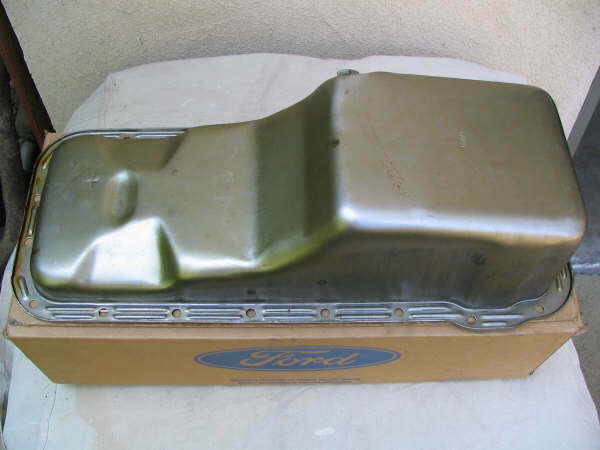 Ford identified these oil pans using basic part number 6675. 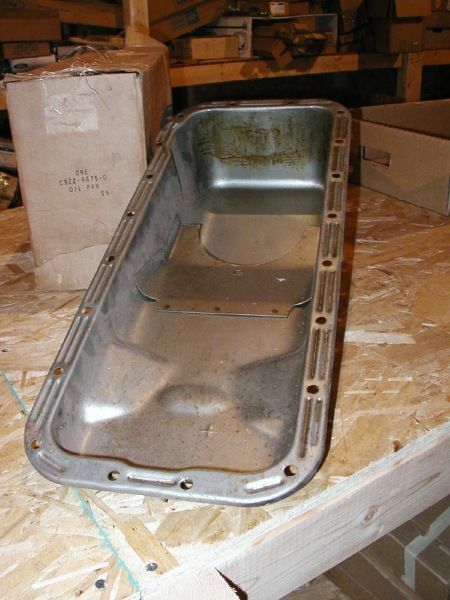 Oil pans installed during engine assembly were painted blue along with the block, heads, and other engine items. 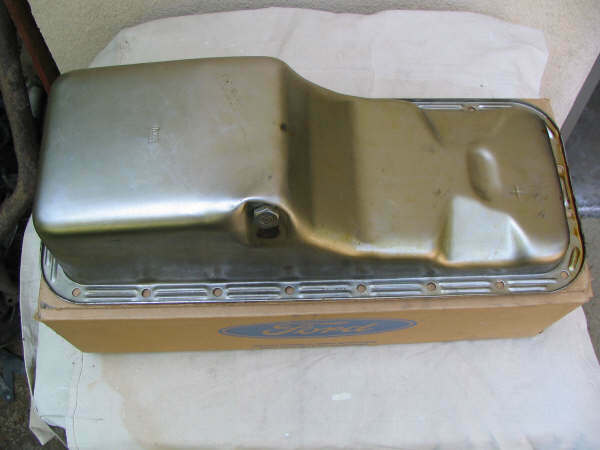 1968 Mustangs equipped with a 428 CJ engine received an oil pan identified by service part number C6OZ-6675-A. 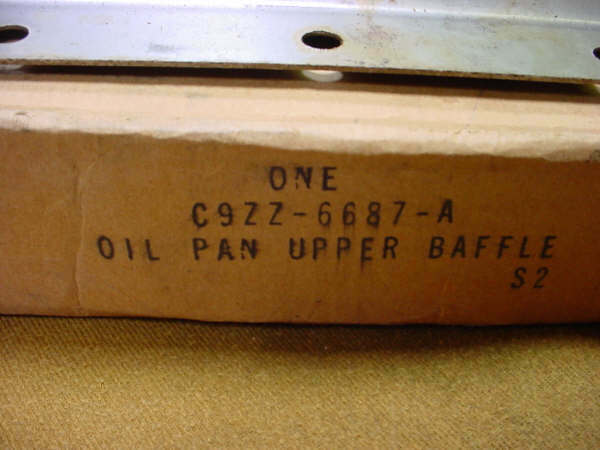 This same pan was also used on other FE engines. Other common applications include 1967-1969 Mustangs equipped with a 390 and 1968 427 engines. This pan differs from some other FE pans by including indentations along the rear sides to provide steering linkage clearance. Note the internal baffle. The C9ZZ-A pan appears to be identical to the C6OZ-A pan. It was replaced by the C9ZZ-B pan, which includes the same pan and a different internal baffle with a cutout that looks like a rectangle with rounded corners (sorry, we don't have a picture). Ford released the C9ZZ-D pan within a few months of releasing the C9ZZ-B pan. The C9ZZ-6675-D pan again includes the same pan and a different internal baffle, this time with a cutout in the shape of a semi-circle (see below). We haven't been able to document release dates for any of these pans, but we do know that the engineering drawings are dated during the autumn of 1969. 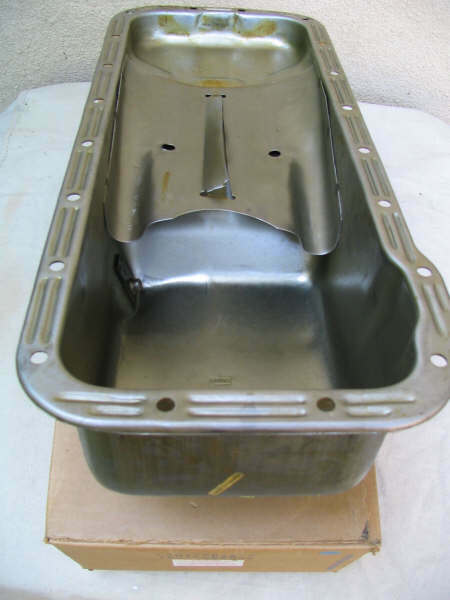 It appears that cars built early in the 1969 model year may well have come with the C6OZ-6675-A pan. Ford documentation also notes that the C9ZZ-B pan was replaced by the C6OZ-A pan from a service parts perspective in the early 1970s, so the C9ZZ pans are relatively uncommon. 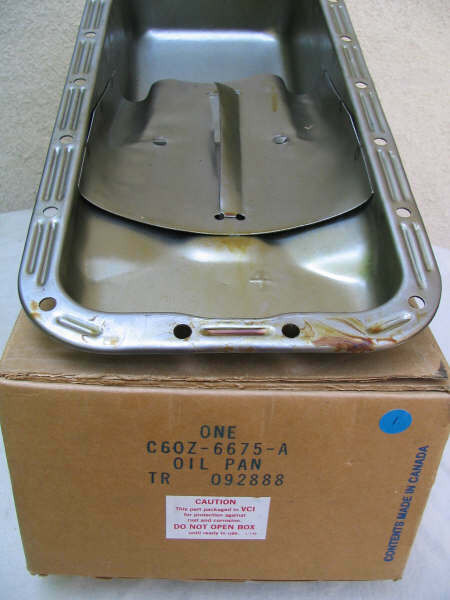 The 1975 Master Parts catalog also lists a pan for "All High Performance Vehicles" under service part number C8AX-6675-A. 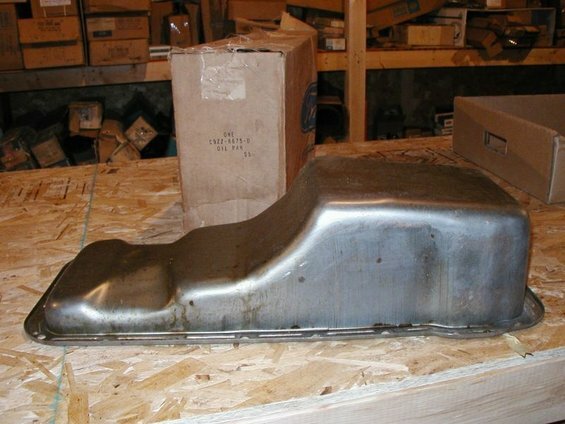 This is a Ford Muscle Parts item that was never used in production. It is described in the MPC as "Deep sump - 7 qt. - requires special pick up". 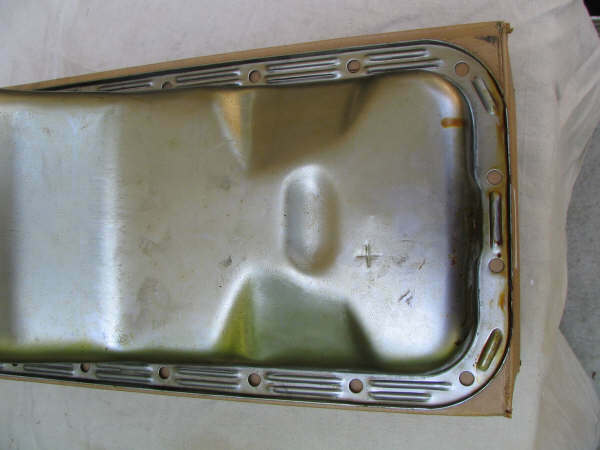 A windage tray first appeared at some point during the 1969 model year. 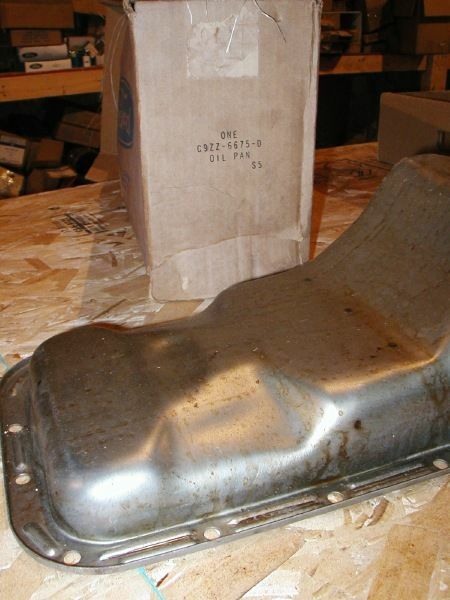 This stamped steel tray, sandwiched between the block and the oil pan, is sealed in place using two oil pan gaskets. The tray was used to keep pooling oil away from the crankshaft as it rotates. This part was serviced using part number C9ZZ-6687-A. Two versions of the windage tray were used during the production period, and both were serviced using the same C9ZZ-6687-A part number. 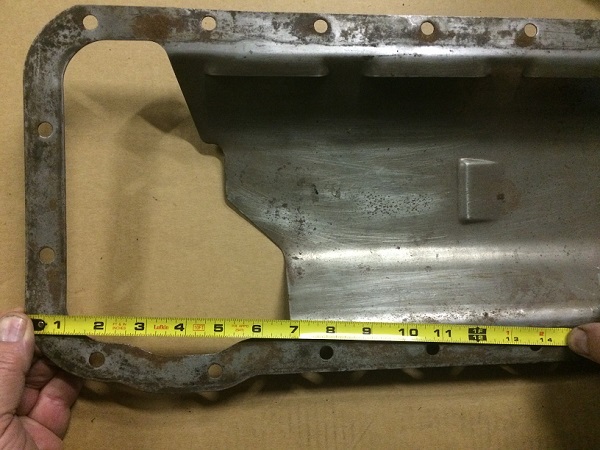 The first version was identified by engineering number C9ZE-6687-B, though this number does not appear to have been stamped anywhere on the part. The engineering specifications for this part were released in July, 1968, and revised in August, 1968. We're still unsure of the actual production introduction date. The second version was identified by engineering number C9ZE-6687-F. The engineering specifications for this part were first released in December, 1968, with dimensional modifications to the area around the oil pump. The specifications were revised again in February 1969, and released in March 1969, to include a pair of 3.62" x 0.12" notches along the passenger side edge. 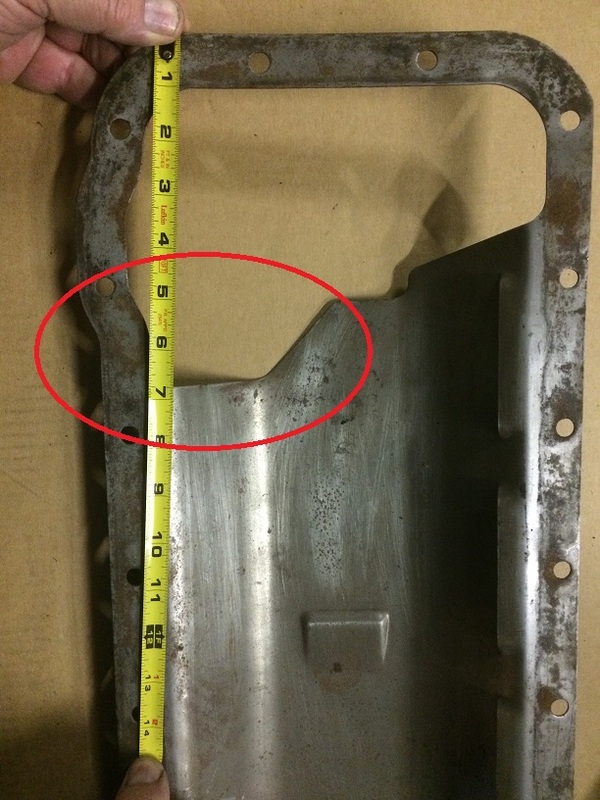 According to Ed Meyer, these notches were added to provide clearance for two "J"-shaped metal straps that were used to secure the starter cable to the side of the engine. The notches allowed the straps to lie flat against the area where the oil pan is attached to the cylinder block. We believe these straps were unique to 1970 CJ and SCJ engines. The two pictures below illustrate the change in the oil pump area. 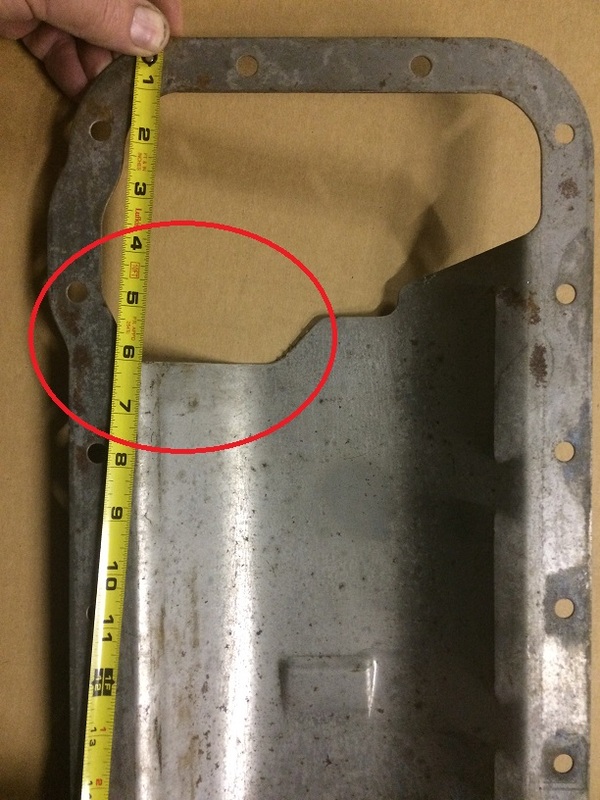 This is the C9ZE-6687-B windage tray with the smaller opening in the oil pump area and no notches along the passenger side edge. This is the C9ZE-6687-F windage tray with the larger opening in the oil pump area and no notches along the passenger side edge. 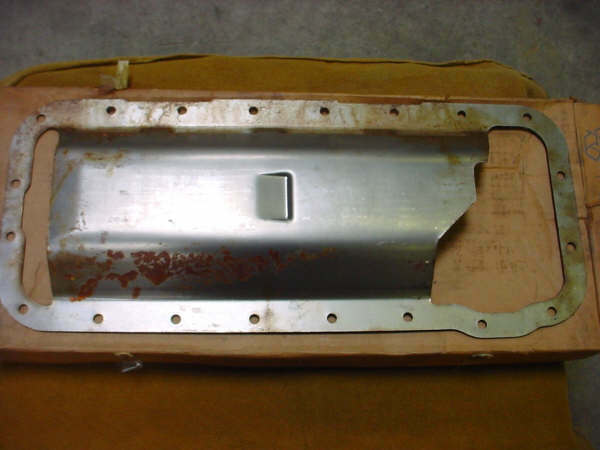 This is the C9ZE-6687-F windage tray with the larger opening in the oil pump area and notches along the passenger side edge. Thanks to Royce Peterson, Phil Parcells, Jack Brooks, and Ed Meyer for helping with the pictures and information used here.